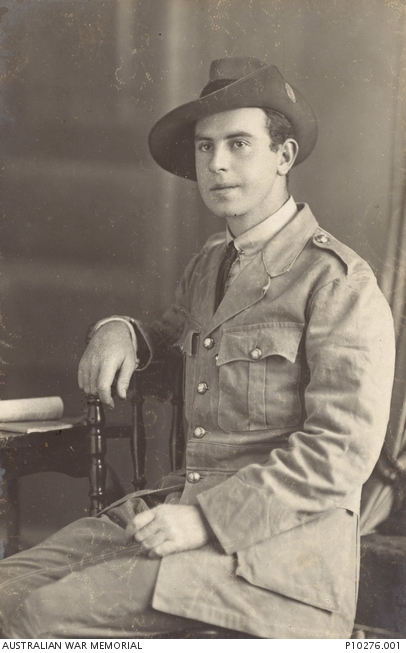 Studio portrait of Private (Pte) Robert Bruce McKenzie wearing an Australian Naval and Military Expeditionary Force (AN&MEF) uniform. A shipwright from Balmain, NSW prior to enlistment, Pte McKenzie, joined the AN&MEF on 11 August 1914 and served with C Company in Rabaul, Papua New Guinea. He was discharged from the AN&MEF in March 1915 and then enlisted in the AIF. 596 Able Seaman Driver (ABD) McKenzie embarked with the Royal Australian Naval Bridging Train (RANBT) from Sydney aboard HMAT Port Sydney (A15) on 9 May 1917. He transferred as a Driver (Dvr) to the 2nd Pioneer Battalion on 14 September 1917. While serving on the Western Front, Dvr McKenzie removed two German plaques from a train carrying a German delegation to Trier for negotiations to extend the Armistice. This meeting was held on the 13 December 1918 and was presided over by Marshall Foch. On his return to Australia in September 1919, Dvr McKenzie brought these two plaques with him, one of which is now held in the collection of the Australian War Memorial (see REL42810).